“Here’s the deal, folks. For a group to learn together, it’s gottaaa…” and here the conductor of the Macon, Georgia Thrifty Town training seminar overestimates the trainees, gesturing to his bored audience to fill in the blank, except no one does, because nobody wants to get called on, so he answers his own question after just long enough for it to be embarrassing, saying, “…laaaugh together.” Rectify is surprisingly funny for a show about a Death Row inmate slowly readjusting to life on the outside and also he may have done it, that is, strangled his girlfriend to death as a teenager, so the show’s in a perpetual state of flux and still manages stuff like, “Give Amanda a hand, everybody.” But on the subject of growing together, as funny as the show is, the Holden-Talbot-Stern clan don’t do a lot of laughing together, because the “together” part is practically nonexistent anymore. Remember family dinners, parties, even legal matters? Now Janet and Ted are frosty, Tawney and Teddy come this close to couples counseling before their natures wreck everything, and Amantha’s moving on from Jon. She’s also finally facing her brother’s possible guilt. Irritated at being called Amanda and pulled onstage—Abigail Spencer’s body language is like one big hilarious cringe—and frustrated that her small talk wasn’t satisfactory, she tells the audience about her brother. And then the conductor makes a joke about Daniel owing Amanda a coke, and that’s the turn. By the end she’s laughing and crying simultaneously, because there’s a lot she’s releasing in that impromptu speech. Notice the way she repeats the phrase, “until I.” Things were one way until Amantha got involved. She’s proud of what she was able to accomplish, and she’s overwhelmed by how much she has invested in Daniel’s freedom. And now it might be for naught. “He said he did it.” Yes, but only in the debriefing. But the way Amantha tells her story, it’s as if Daniel confessed privately and then went on record. It’s as if his recorded confession retroactively made him guilty in her mind. At the end of season two, she tells him, “If you go in there and say that you killed Hannah and it’s the truth, then so be it, but if you go in there and say that you killed her just because you don’t want to deal with this anymore…then you are a coward, Daniel.” She’s clearly only considered the second part. “Then so be it” is an expression of nothing. It is what it is. She was putting off dealing with that prospect at the time. Now that Daniel’s made it the historical record, things are different. Hence her anger at Daniel over dinner last week, and her resentment the week before. As she tells him in the season two finale, “You can say people are gonna think what they’re gonna think, but there is a difference. There is a difference.” Again she repeats something for emphasis. Maybe it was just a threat, a way to push Daniel into not taking the plea deal, but clearly the official history matters to Amantha. This has been her entire adult life, too. At the time she says she wanted to clear their name. To which Daniel responds, “Then change your name, Amantha.” Is he saying the Holden name can’t be untarnished? Because he’s guilty? “Yeah, it’d be so bad.” Jon repeats Daniel’s exact phrasing back to him, like in elementary school when you learn to use full sentences. “You know why? Because you haven’t given this a chance.” I don’t know if that’s exactly right, and it’s certainly a tall order—what lingers most from season one is how permanently Daniel’s mind had to change to accept solitary confinement and Death Row. But since he’s been out, he’s been a loner and a weirdo and he’s fallen for a married woman and assaulted her husband. As Jon comically puts it, “Are Teddy and Trey the only people you’ve assaulted since you got out?” He’s sincerely not sure, and until a few minutes prior, he didn’t know his client had assaulted anyone. Both instances are relatively, somewhat, kind of understandable, if not excusable. Jon’s right that Daniel needs to see someone about controlling his temper. But the Teddy attack wasn’t a loss of temper. Daniel was walking away and then turned around and decided to teach Teddy a lesson in humility. If you squint you can see how he wasn’t trying to traumatize Teddy. But the fact remains. What does Daniel do after hearing Jon’s advice? He sets about working on the pool immediately. At night. This isn’t just about Daniel not being able to sleep or wanting to see the fruits of his labor. He’s being antisocial. I guess his old and very understanding friend Melvin poked one too many times at a sore spot in Daniel’s life. What’s more, it’s hard to think of anything Daniel could do to show that Jon’s advice hasn’t changed him one iota than working on some unwieldy project alone at night. 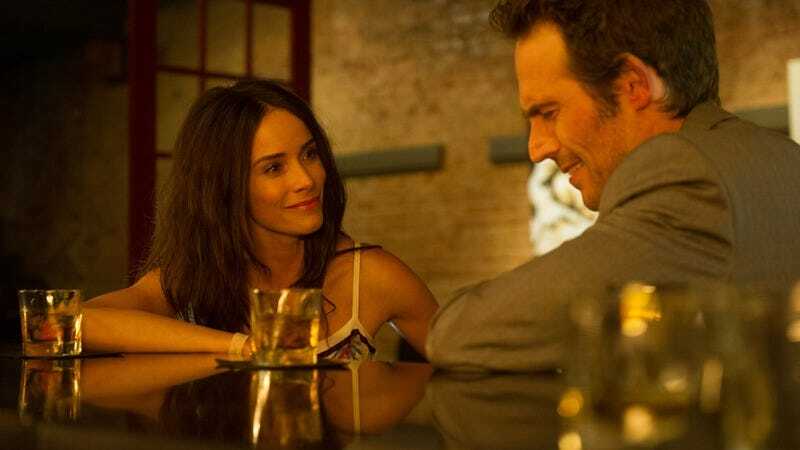 Meanwhile in Macon, Amantha meets a handsome stranger played by Michael Vartan at the bar. “I’m Forrest.” “I’m Trees,” she says without missing a beat. Like Daniel and Melvin talking about where Daniel could go—Tunis, Carthage, Tennessee—Amantha and Forrest talk about where they’re going. He’s off to Valencia, she’s…going places, according to him. But really she’s putting down roots in a town she hates at a job she tolerates, and that is bringing out the worst in her. Getting Daniel out, now that was a task that summoned all of Amantha’s energy. It challenged and fulfilled her. Now that it’s over, she ought to be doing something similarly rewarding. But as Forrest points out, she’s self-deprecating to a fault. She’s been thoroughly unmoored by Daniel’s confession, which comes hand in hand with Jon leaving town. Now what does she do? Well, after hooking up with Forrest, that is. Vartan’s quite a name for a single appearance, but he’s supposedly off to Europe. Then again he swears he’s never met anyone like Amantha before, so who knows what the future holds for him? As for Amantha, this is the first time she’s turned off autopilot this season. She’s taking a step, not necessarily forward but in a new direction nonetheless. “Sown With Salt,” which takes its title from Daniel’s description of Carthage and Tunis, destinations he has in mind but can never go to, is written by Coleman Herbert and directed by Billy Gierhart. Daniel’s probation officer, played by Roxana Brusso, is named Lourdes Williams, presumably after the Pyrenees pilgrimage site. Melvin’s pretty sure about how to paint a pool. He’s watched a Youtube video. Daniel: “I’m not used to deciding anything. Postponing is more my strength.” Sure, but Daniel’s also just mercurial. He gets in moods where he’s hot to trot about something, and then he gets in moods where he’d rather watch worms and contemplate soil. Teddy surprises Tawney at their house, and then he apologizes because he’s not supposed to be there. She says, “It’s not not supposed to be here. It’s just you said you wouldn’t be.” It’s not the fact of Teddy’s surprise, but the lie that has Tawney on edge. Bless Sean Bridgers for saying half his lines with his mouth full. It’s practically a Law & Order scene, helpfully explained at the end by the line about Carl surprising him at work, but Bridgers brings that extra bit of real life to it. Speaking of quoting other shows, the paint-roller-cam is an unfortunate Breaking-Bad-ism. Carl calls out Daniel and Trey each for assuming George had died. Daniel says he misspoke because he was nervous and because the fact of Carl’s casual interrogation suggests foul play. Trey says he was just makin’ a joke. Is it the nervous guy or the smooth operator or both Carl should be suspicious of? Great touch: When we cut back to Teddy and Tawney after some time has passed, they’re sitting pretty much right where they were. Neither had moved since Teddy popped in. They just froze in place. Teddy, his head hanging low: “I think Dad knows what Daniel did to me.” So every time Teddy catches his father using kid gloves, it just amps up the tension. But the problem is if Ted were stricter with Teddy, that wouldn’t help him, either. That said, Clayne Crawford delivers the line like it’s relatively matter of fact, which is heartening to hear. It must be all the more powerful for him to be able to talk openly about it with someone. Another reason he needs his wife right now. Janet’s so over Ted and the kitchen and Ted, Jr. and their treatment of her baby. “If wood’s too expensive, Ted, just get vinyl. I don’t really care.” There’s something about her using his first name there, the kind of thing you do when you’re just fed up. It’s an “I’m not touching you” move.